Parents might be a little hesitant regarding this Playmobil School 4324 Furnished Building Review themed playset. Well, don’t be because this playset is something kids will love to play with. They can have their own self-directed play in this large playset. Engage your children’s creativity and imagination in this interactive set. They can act out their own experiences from the classroom or make up stories of how they want it to be. This can also be a way for parents to learn about how their children do in school. 3 Where Can You Buy It? With the large School Set #4324, your child will find amazing details that make it look very close to his own school. It has classrooms for taking lessons, restrooms, and an open staircase. Also, there are essential accessories that every kid will find in their own schools. The building, which has an open design, also includes students and teachers. Your kid can be the teacher and teach the eager students in the primary classroom. They can also have classes in art and music or science in other places in the building. They can also become the students and listen to the teachers. They’ll be doing their homework again. There are accessories to make the lessons realistic such as a globe and skeleton. 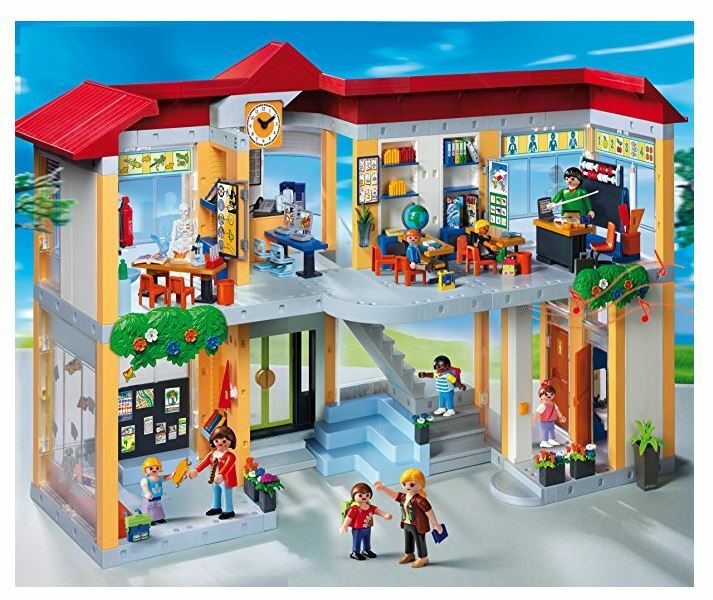 Not only that, this is compatible with other smaller Playmobil sets as well so that you can add a gymnasium, woodworking/shop class, music class, canteen and others. You can get these additional sets and make your building look even more realistic. Not only do your children learn to use their imagination and creativity in creating stories with this playset, but they can also apply what they have learned in the classroom that day and teach that to their “students” in their play school. Kids having broad imagination will have no dull moment with this playset. 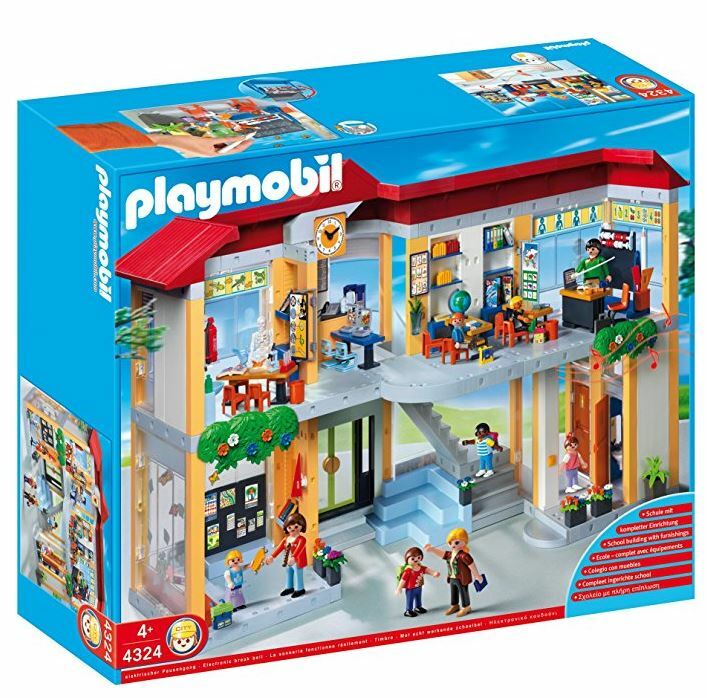 The Playmobil School 4324 Building set has served as a great option as a gift for numerous people, and pretty much all are satisfied with the results. Kids love to put this together with their parents as it requires a bit of help. Users have loved how interactive this is and that it gives them a lot of family bonding time while putting it together. It also helped to bring out the artistic side of kids during assembly as they can change things up and be express their creativity easily. The detailing has been loved by the children and the parents alike as it is very accurate and justifies the high price tag. Parents enjoyed watching their children pick their brains while playing and the children love the end result as well. Once built it becomes very sturdy and will not break down quickly. One great thing customers love is that because it is so detailed and precise, the little ones tend to spend lots of time with it and play with it for really long times, unlike a number of games they tend to get bored with really quickly after purchase. Users have found it rewarding and robust and better than Lego sets that do not last very long or break down quickly. One thing users have not loved about this product is that it takes a while to put it together. This is not suited for very young children, but would only cater to older kids who will have the patience to put it together and understand the mechanism. It comes with numerous little parts separately in plastic packing. Some users have found this to be unnecessary and time-consuming. Kids’ll definitely play with this set for years to come, so get this fantastic set for your kids now. This is the best Christmas present for a kid who loves to play with reality-based playsets. The demand is on the rise, and the stocks are running low because this playset has won several toy awards in Europe. To get yours now click on the link to buy Playmobil Set on Amazon!